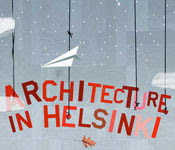 I know I've blogged about this troop before, but I recently re-checked out Architecture in Helsinki's website. Not only do I like hearing clips of tunes like "Maybe You Can Owe Me," "It'5!" and "Do the Whirlwind," I love to see the trees and skeletons and stringed-lights and leaves that take flight when you click on the links at the bottom of the page. It's like arts and crafts meets the Grim Reaper meets the Black Pearl: practically a visual nexus of my interests and my husband's. If they threw in some ninjas and some Evil Dead references, it would be complete ... at least for him. I think it's pretty great as is. I love a band with a good sense of humor. I also love that they offer a free download of Metronomy's remix of "Do the Whirlwind." Just click on "keepsake." One of my favorite bands and websites! I read the comment you left on my blog the other day and it appears that we have been snooping around one anothers blogs unbeknownst to the other. You have fantastic taste in music, and it appears that you and Christy are cut from the same bolt of Domino approved cloth. She reads Your Heart Out religiously by the way.